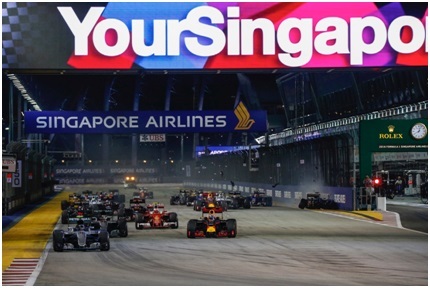 Singapore, 2 December 2016 - Race organiser Singapore GP announced Early Bird prices for the 2017 FORMULA 1 SINGAPORE AIRLINES SINGAPORE GRAND PRIX, scheduled to be held from 15 to 17 September 2017. From 3 December 2016 till 8 May 2017, fans can save up to 28% off regular ticket prices for the tenth edition of the iconic night race. A total of 21 ticket categories will be available during the Early Bird phase, including the three-day Super Pit, Pit, Turn 1, Turn 2, Padang, Bay, Stamford, Esplanade Waterfront, Connaught and Turn 3 Premier Grandstands, single-day Sunday Pit Grandstand as well as the three-day Premier Walkabout, Zone 4 Walkabout and the wheelchair accessible platforms at Marina Pit and Empress Place (S$38 - S$2,128). See Annex 1 for ticket prices. In addition to the three-day Zone 1 Walkabout Combination, Singapore GP has also launched three new combination ticket categories - Pit Combination (S$888), Padang Combination (S$598) and Stamford Combination (S$498) where a seat is offered at either the Pit Grandstand, Padang Grandstand and Stamford Grandstand on each of the three days of the race weekend. The Stamford Grandstand boasts several excellent vantage points and offers overtaking opportunities when the cars negotiate Turns 7 (the Memorial) and 8. Three-day Stamford Grandstand tickets will be available during the Early Bird phase at a revised price of S$398 for 2017 - a 20% savings as compared to 2016. Fans can now enjoy over 20% off the regular three-day Stamford Grandstand ticket price during this Early-Bird phase. For the first time this year, Singapore GP introduced a brand new junior ticket for Pit Grandstand during the Super Early Bird phase for fans aged 16 years and below. A total of 3 grandstands will be offering junior tickets during the Early Bird phase. Young Formula 1® fans will now also be able to enjoy seats at the Turn 1 and Turn 2 Grandstands at a discounted price of S$638, approximately 50% off the regular ticket price. Fans can now stretch their dollar further and purchase their preferred grandstand with the introduction of a new payment option for the tenth edition of the night race. For the first time, fans who purchase 2017 FORMULA 1 SINGAPORE AIRLINES SINGAPORE GRAND PRIX grandstand tickets between now till 31 May 2017 can opt to pay for their ticket purchases via an interest-free instalment payment plan, subject to a minimum purchase amount. Early Bird tickets for the 2017 FORMULA 1 SINGAPORE AIRLINES SINGAPORE GRAND PRIX will be available for sale from tomorrow (3 December 2016), 9am via www.singaporegp.sg, via the ticketing hotline +65 6738 6738 as well as all Singapore GP's authorised agents.